Layers of berries, cake and whipped cream, oh my! Create an easy and delicious dessert in no time. Heat up milk in a pan and add sugar in it. Mix corn flour in 4 tbsp cold milk. When milk starts boiling than add corn flour and keep mixing milk while adding corn flour. Turn off the stove and add vanilla essence and let it cool down. Keep mixing it after some time to avoid custard layer over it. Grease Swiss roll tray of 13×8 size. Place butter paper over it. Beat eggs in a beater till they become fluffy. Add caster sugar in the eggs spoon by spoon and keep beating them. Add vanilla essence while beating. Fold white flour very carefully in the beaten eggs mixture. Do not beat. Pour this mixture in the greased tray and place it in preheated oven for 10 minutes at 190c. Take a clean napkin and dust it with icing sugar. Place Swiss roll sponge over this napkin and roll it with napkin. Unroll it and spread strawberry jam over it. Roll it again, this time without napkin. Cut slices of jam rolls and place them at the sides and bottom of a serving dish. Place jelly cubes in the centre of the serving dish. Soak sponge of jam rolls with strawberry juice and place strawberries over it. Add cream in the custard and pour it over Swiss rolls sponge. Pour blue berry pie filling tin in the centre of the custard. 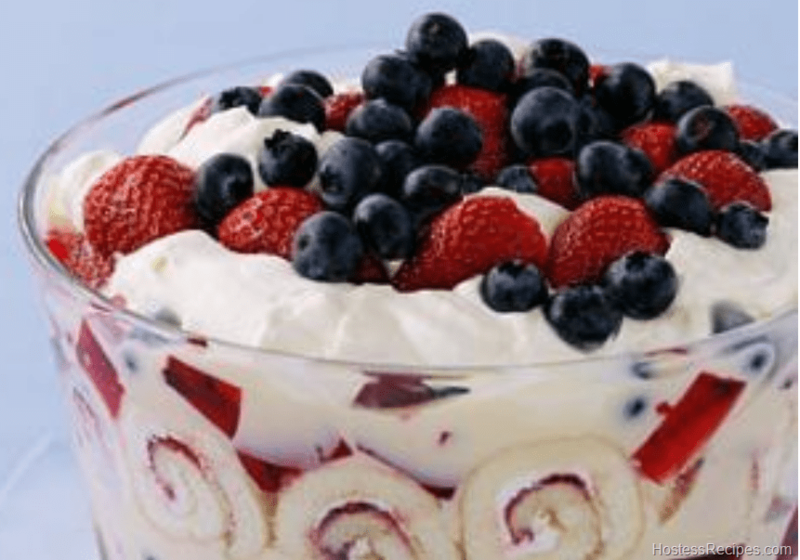 Garnish with whipped cream and cited jelly at the sides of the dish. And serve.